Tinder already lets you judge people according to their Instagram photos, but hyper-local dating app Happn is taking that up a gear by adding Spotify integration. From today, users of the app, which shows potential partners who you cross paths with, can share songs from Spotify’s catalog on their profiles. 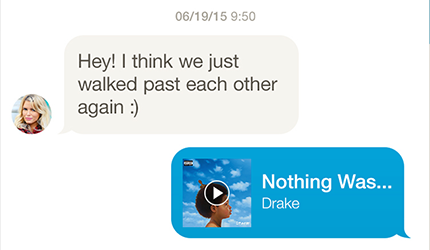 You’ll also be able to send songs to your matches through its messaging function. The feature is open to love seekers on Happn whether they have a Spotify account or not. If you’re rocking a Spotify Premium account you can hear full tracks. Without one, you’re limited to 30 second snippets. Music taste can be a pretty good yardstick to measure how well you’ll get on with a potential mate, but it’s far from foolproof. Still, I know a couple where the woman loves death metal and the man is obsessed with K-Pop, and that works…so far.